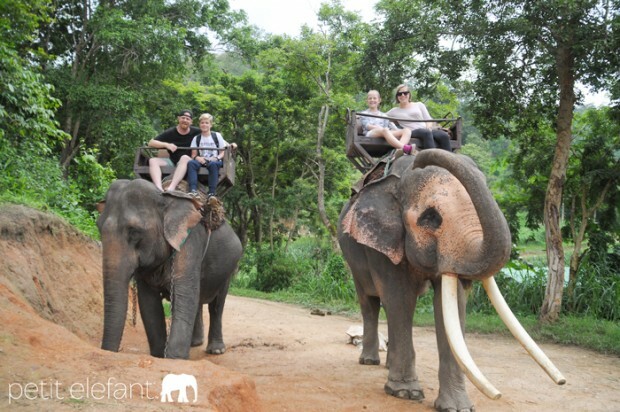 Last month our family of four ventured to Thailand for an epic vacation. It was so.much.fun. We spent a week in Koh Chang, a day in Bangkok, and then we flew up to Chiang Mai for eight days. It felt like every day was filled with some awesome new adventure. If you ever find yourself in Chiang Mai (which I highly suggest you go), then you might check out some of these family bonding, memory making activities. 1. Riding Elephants. Ok, this is one you just can’t miss out on. I mean, how often do you get the opportunity to ride an elephant? We went to Maesa Elephant Camp. Of course it was touristy, but it was fabulous. We enjoyed a cute show by the elephants and then a 30 minute elephant ride (they have longer and shorter rides). After the show you can pose with the elephants for a photo. You might risk getting kissed on the lips by them like I did, but at least my husband got a photo of it. 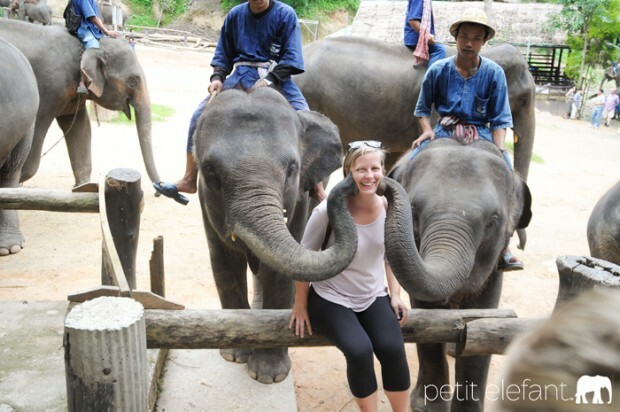 They do enjoy monetary tips for their photo poses, the trainers that is, not the elephants. 2. Cooking School. I was skeptical if my 14 year old son and 11 year old daughter would think this was fun. We all absolutely loved it (although I am glad we only did a half day instead of a full day). 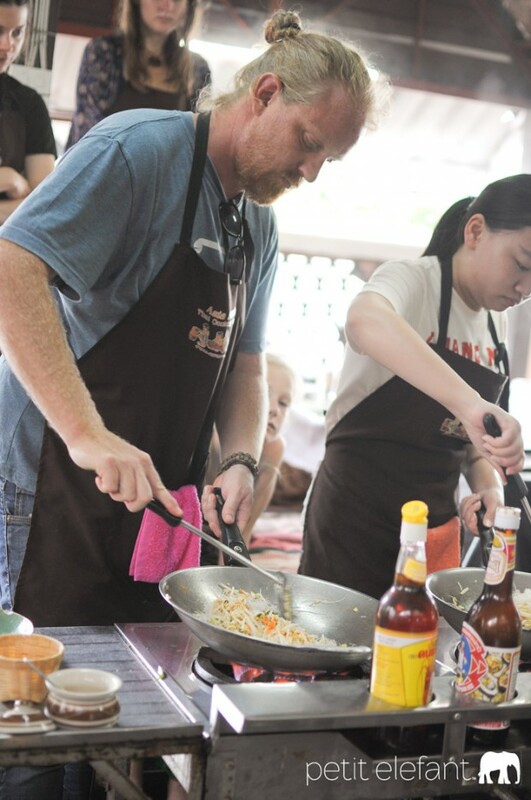 Asia Scenic Cooking School was the best. We went to the market and learned about different ingredients and then we made four dishes. So fun. You cook, sit and eat, and cook some more. They also gave us a cookbook to take home at the end. If I hadn’t of taken this class, I would never have realized how easy it is to make pad thai or how incredibly tasty panang curry is! 3. Sticky Falls. I feel like Sticky Falls otherwise known as Bua Tong Waterfall is a hidden gem. It’s absolutely free to go, and a perfect place to have a picnic. It’s also the only waterfall I know of where you can hike from the bottom to the top through the falls. I would bring some bug spray as the mosquitoes were quite annoying. On a hot Summer day, this place is so refreshing. 4. Fish spas and massages. It is incredibly cheap to go to a fish spa, and it’s quite the experience. You can probably imagine the tickle you feel when they nibble away the dead skin on your feet. Fish spas are everywhere and for a few dollars, it’s worth the experience. It’s also cheap to get a massage ($6 – $10 for a one hour massage at some places). If you’re brave enough, you can try the Thai massage. I hear it’s quite painful, but you feel like a million bucks afterwards. Obviously, I wasn’t brave enough. 5. Markets. If you like to shop, then you won’t be disappointed. There are markets everywhere. Perhaps the most famous is the Night Bazaar. When the sun sets, the vendors come out. There’s restaurants, fish spas, and goods of all kinds to purchase. We bought most of our souvenirs here. There’s also a Sunday Night Market Walking Street at Tha Pae Gate. You should know that the street is narrow and the crowd is big. If you want to avoid the swelling crowd, I would suggest getting there when it opens at 4 PM, but bring a bottle of water. It’s quite hot at that time. What sets this market apart is that there is more handmade wares made by the vendors themselves. My favorite market was Warorot. It was eye candy to a crafter’s eyes. You can mostly find amazing textiles here, both old and new, at cheap prices. If you’re wanting a more local market, this is the place to go. If you’re feeling adventurous, pick up some cockroaches or grub worms, for eating, that is. If you’re not feeling adventurous, stop into Thamel for a bite to eat or a refreshing smoothie. Downstairs you will find beautiful craft from Nepal. Upstairs, the atmosphere and food will refresh your soul from all the shopping. 6. International Food Park. 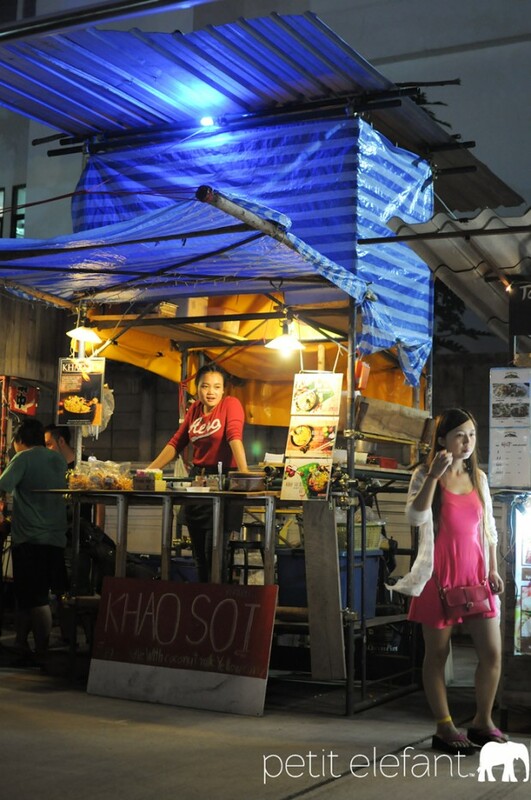 We visited several different restaurants during our time in Chiang Mai, but my favorite was Ploen Ruedee Night Market. It had a great atmosphere with food trucks of every kind dotted all over the place. Burgers, sushi, noodles, curries, mojitos, pancakes…they had it all, and it was so good and so cheap. It’s very close to the Night Bazaar if you’re down that way. I do hope you find yourself on a plane headed to Thailand someday. There’s so many fun, interesting things to do and experience. For those of you who have been, what was your favorite thing you did that’s not on this list?